My Garden Journal: July's Delphinium [H6920] - $7.50 : Yarn Tree, Your wholesale source for cross stitch supplies. 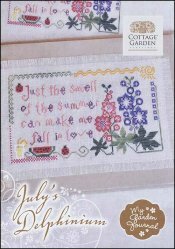 Cross stitch pattern from Cottage Garden Samplings. Part 7 of 12 in the My Garden Journal series by Cottage Garden Samplings. Verse reads:"Just the smell of the summer can make me fall in love". Lady bugs are making their way to the colorful summer flower. The My Garden Journal series can be stitched alone (125 w x 74 h), stitched together (379 w x 302 h), or combine them to create a scrapbook journal. Can be stitched on #8684 Belfast Linen Smokey Pearl.